Unrest has returned to Foxconn's Zhengzhou factory as thousands of workers went on strike Friday. About 3,000 to 4,000 employees began the strike at 1 p.m.(UTC), paralyzing production of iPhones for much of the day and night shifts, according to non-profit China Labor Watch (CLW). The factory in the capital of the Henan Province reportedly employs 130,000 workers who assemble an estimated 70 percent of all iPhones. CLW said it blames overly strict quality control demands, lack of necessary training and denied vacation time as contributing factors to the strike. 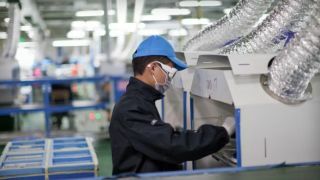 Work conditions in Foxconn factories are notoriously bad, as workers have often complained about poor working conditions and extremely long hours. Experts say the main culprit is added pressure put on workers by Apple's iPhone 5. With such great demand for the new iPhone, workers were pushed to work longer hours and forgo holiday leave. However, assembly line workers weren't given the proper training to create the complex devices, contributing to quality control problems. After complaints from consumers about out-of-the-box iPhone 5 scratches, Apple and factory management increased quality demands on employees, according to CLW. Without the proper training, fabricators couldn't produce iPhones that met quality standards. This pressure lead to physical fights between on-site quality control inspectors and factory workers. These altercations damaged several QC inspection rooms, injured employees and landed some in the hospital. Managers ignored the violence, even after QC inspectors complained to factory bosses. This prompted inspectors to strike, leading to work stoppages on production lines. "This strike is a result of the fact that these workers just have too much pressure," Li Qiang, executive director of CLW, said in a press release. It's hard to tell how this will affect production of the iPhone 5 in the near future. QC inspectors make up a majority of striking workers. The number of striking workers is only a fraction of the people employed by the factory, but it was still enough to stop much of the day's production. Riots temporarily stopped work in late September due to clashes between assembly line workers and security guards. Experts warned at the time that if the underlying problems, such as overextending the work force, weren't resolved it would cause more problems. Friday, those problems have bubbled to the surface once again. Apple has yet to respond to TechRadar's request for comment.